In celebration of the year gone by, the Star-Bulletin's staff photographers have prepared this collection of their most meaningful images of 2005. On any given day, our photojournalists might be asked to capture the drama of a crime scene, the excitement of a sporting event, the simple pleasures of island life -- or perhaps all of the above. The images on these pages reflect that vital mix, as each photographer was asked to select a single favorite piece, with no specific criteria. They chose these pictures for their news value, their emotional impact or in some cases, for their simple beauty. This was a beautiful day for the senior class of St. Andrew's Priory School. The junior class decorated the courtyard to honor the young women before them as they proceeded through their rite of passage called the Ascension Day Coral Cross Ceremony. 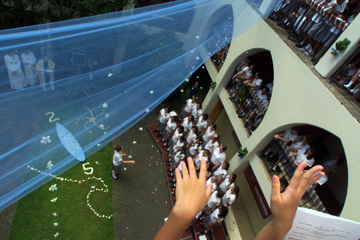 At the culmination the class sang "I Hope You Dance" as girls gently dropped petals from the balconies. You can almost hear the singing while looking at this photograph. On Nov. 30 a dump truck and a school bus were involved in an accident at the intersection of 9th and Waialae avenues in Kaimuki. "Arriving on the scene, I was relieved to find no apparent life-threatening injuries. It was very chaotic, with Police and Fire Department personnel tending to the victims. 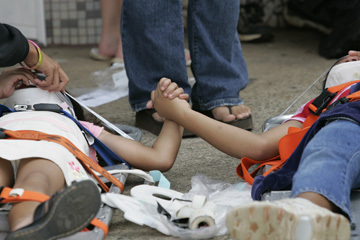 At one point two of the victims reached out and held hands. In times of stress people seek comfort in each other, young or old. These two girls were going to get through it together." "Luck plays a large part in sports photography, but you have to be ready as well when something happens. When I saw Michihisa Asano celebrate after decking Steven Okano at an MMA preliminary fight at the K1 World Grand Prix at Aloha Stadium, I had only a second to compose and shoot the photo." "I was driving by Manoa Valley District Park when I noticed the parking lot was full of cars. I thought I'd stop to see what was going on. ... When a lot of people are gathered, there's a chance for a good picture. I found out it was the Manoa East/West Classified Swim Meet. I took the usual action pictures, but my favorite was of these girls just having a good time while waiting to compete. One of them, Rachel Owen, had written on her back, 'GO Slow! & Let Me Win!' I love these slice-of-life photos, even though they may not be big news and people tend to overlook them. This image wasn't selected to run in the newspaper at the time, but I think these fleeting moments of everyday life are great." With Rachel are her cousin Becky Owen, right, and friend Nicole Mitsunaga. All three are 11 years old, swimming for Manoa Aquatics. A Youth Outreach client named Angie pauses to hug the safe-house mascot, Starr. Located in Waikiki, the safe house seeks to give temporary shelter and health education to runaways on the streets of Waikiki. "In our profession, much ado is often made about overseas assignments and coverage of the 'big stories.' But community news has just as much potential to open our eyes and our hearts. In a year of so many national and international disasters, it is sometimes easy to forget the need and tragedy in our own back yard." 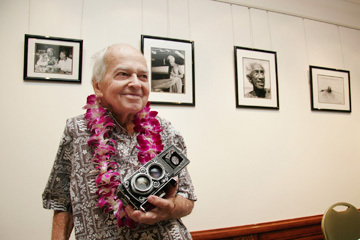 "I worked with Hawaii photojournalist John Titchen for years, so it was only fitting that I take his portrait when he opened an exhibit of his pictures of Duke Kahanamoku. We took our time, doing a lot of reminiscing and laughing. We even drove to my home to get a Rolleiflex, the kind of camera John used to take the Duke's photos. As we worked, he proudly signed autographs for awe-struck tourists, acknowledging his part in recording the history of modern Hawaii." "This photo of a competitor in the Honolulu Triathlon is a reminder of my trip to Sportsshooter Academy in February. My mentors there stressed the importance of using light to your advantage to make dramatic sports pictures, because our eyes see things differently from the camera."